It’s Thursday and it’s my last day here in Maui. So sad. Actually I’ll still be here for most of Friday, but much of that time will most likely be spent hanging out at the airport. Whoop. I felt bad that I haven’t blogged since Monday but then I stopped feeling bad b/c I’m on vacation, I shouldn’t have to blog :)! But I will anyways. Jake took the day off of work and we went out to hike the hills of Maui. I’m not much of a hiker. I know Portland and the NW has great places to hike, I just never do it. It’s not something I think about doing on my days off. Plus the last time I went for a hike was 4 years and 30lbs ago and I thought my heart was going to explode, so that may have added to my avoidance. The first hike was labeled ’strenuous’ and it was just that. We got out of the car, and immediately we were faced with a steep hill that didn’t seem to end. The hill did end, but there were many steep switchbacks to be faced. We hiked along the ridge of enormous hills with over 100ft drops. It was nothing short of spectacular and the views were amazing. After three miles of climbing we reached the very top to discover we were surrounded by clouds. It really wasn’t disappointing to be at the top and see nothing but white. It was a bit eerie and exciting as it reminded me of my cloud dream. I wasn’t able to take a chunk out of any clouds, but it was still crazy fun. The way down went much faster then going up, although at times it felt even more treacherous as the rocks were steep and slippery. We found that sometimes it was better to run/jog down the steep parts rather than constantly put on the leg brakes. We reached the bottom and no sooner did we pile into the car before Jake asked if I’d like to go on another hike. I said ’sure’ and we drove off to our next destination. I was drenched in sweat and my legs were a bit tired but I still felt like I had plenty of energy. The next hike was labeled ‘hardy family’ and was only 4 miles round trip, so I figured we’d be fine. And we were. 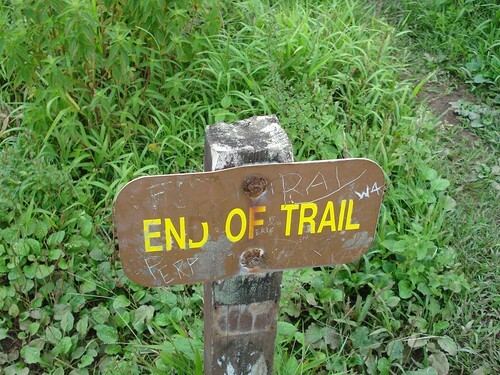 The trail wasn’t nearly as steep as the last hike, and the views weren’t as spectacular either. 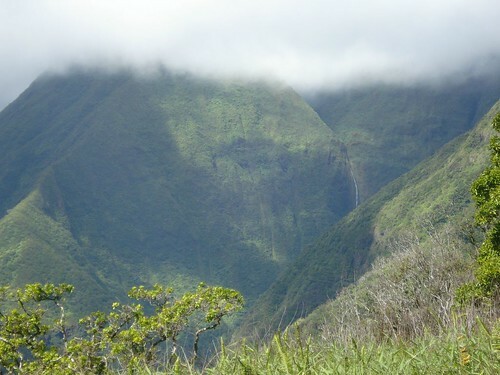 our first hike had us on the very high ridges of Maui looking at the gorgeous valleys, this hike had us in the valleys looking at the sharp ridges. It was a great way to experience the island. Our hardy family hike followed along streams and creek beds. In the middle of the hike we had to cross two different dry beds full of rocks. 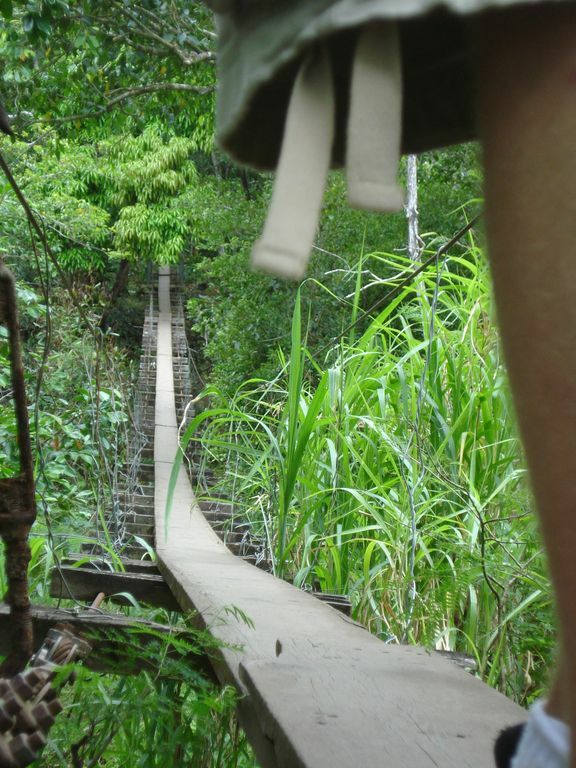 To assist in our crossing was two separate, dilapidated suspension bridges. Long boards lay across completely rotted 2×4s that were then attached with coat hanger wire to cable ‘hand rails’. They were a piece of work and a bit freaky. Some of the long boards were completely split and were hardly nailed to the rotted 2×4s below. Despite the condition, person after person made their way across the bridges. At the end of the trail was a small dam/waterfall thingy tucked away among towering trees, that made for a picturesque place to make a lunch. When Jake and I arrived, there was a bunch of people spread out eating lunch. It seems we were right behind a guided tour of about 25-30 people. We saw that behind the waterfall/dam thingy there were some dry rocks that lay by the stream giving us a good place to rest our bones. We made our way behind the falls just as two buxom beauties bounded in their bikinis off of the waterfall. Yes, life is good in Maui. We sat and ate what little food we had. I brought only an apple, but after 8 miles of hiking, it was quite possibly the best apple I’ve ever tasted. After eating and swallowing our last swig of water we made our way back the final two miles. It was a good hike, but Jake and I agreed that the hardy family hike was no where near the strenuous one. After the hike we had time to kill before picking up Jake’s wife Kara. We drove up to another part of Maui that has awesome views, and ended up on a small farm that grows several types of lavender, appropriately named ‘The Lavender Farm’. We were surrounded by rolling hills, trees and a gentle breeze. It was nice, and maybe a little romantic but it was best just sitting on a huge hill talking with a good friend as the clouds rolled by. We checked out the gift shop which sold everything with lavender in it, but we didn’t buy anything, we only tested the samples. At the end of the day Jake and I were feeling pretty good. I think we were both a bit surprised that we busted out a 10 mile hike on a whim, I’m glad we did it and the sense of accomplishment was thrilling. Definitely a highlight of the week. Too many words! The pictures look nice. Just looking at a picture of that bridge took about 10 years off my life. Looks like a great vacation. I posted a bunch of our pictures over at my gallery! That bridge is insanely freaky..
happen in a Indiana Jones Movie or something..